Niwa’s mission is to start a food revolution — by helping even the least green-fingered of us grow fruit and veg in our own homes. The project wants more of us to get stuck into growing so we can cut food miles, and have access to tastier, fresher, healthier food — but reckons many are deterred by lack of space, time, or knowledge. So founder Javier Morillas has rigged together growing trays, in two sizes, that can accommodate almost any crop imaginable and hooked these up with a lighting and irrigation system (hydroponics) that connect by wifi to an app. You just key in the plant you’ve chosen to grow, and the relevant programme will load, triggering the hydroponics to sequence the right conditions for your plant to thrive. 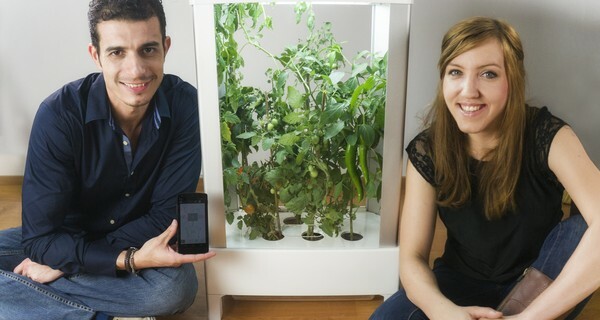 A tiny bit of human input is sometimes required — the app will ask you whether the plant’s leaves are growing, for instance, or flowers appearing, but apart from that it is an almost-wholly automated ‘plug in and grow’ programme. It is costlier than your average growbag though: it retails at $249 and $299. However, the company is still very much in an 'early adopter' phase, and should it meet with sufficient success, will then be able to offer more affordable products in future. As with much innovation of this type, this may never come to pass, and Niwa's energetic founders will then move on to their next idea. Similarly to Solar (Freakin') Roadways, at the very least their work has extended our ambition, and arrived at some neat solutions which will inspire others and find a place in successive generations of food-generating technology.